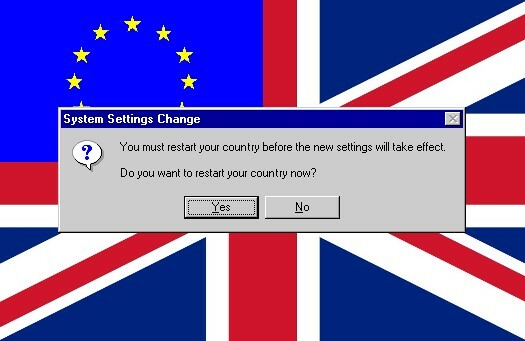 The British Gazette » Brexit: Do you want to restart your country now? The latest happenings of the farce playing at the Palace of Westminster that has for some time gone beyond farce into the most dystopian of black comedies, have again been detailed by the estimable Doctor Richard North in his EU Referendum blog. Doctor North opines that Madame Mayhem must make changes to ensure that the country can proceed down the route of Flexcit – the ONLY doable Brexit strategy. Doctor North points out that this is a huge challenge given the seeming incompetence of the entire political establishment in the UK. When trying to plot a way forward for the UK that does not involve running the ship of state onto the rocks of a hard Brexit, it is not only essential to take the legal aspects of international treaty law and the economic effects of a change of course into account, but also take into account the political considerations; for we must understand that, to use a phrase that Trades Unionist love to use, “the end of the day” ANY agreement the UK reaches with the EU HAS to be ratified by the politicians in the 27 remaining EU member states and those politicians in the European Parliament. What this means is that the politics of the Brexit issue MUST be taken into account. Ever since that glorious morning on Midsummer’s Day 2016 when the British People decided to restore lawful government of this formerly sovereign land, the coterie of imbéciles that masquerade as Her Majesty’s government have blustered and blundered their way through the two year Article 50 period in a manner that will have had the EU commission shaking their heads in amazement. And pity. At the moment, the two major UK opposition parties (Labour and the Liberal Democrats) have two different objectives. The Lib-Dems want to rerun the referendum in the hope of reversing Brexit. That is to say, request the European Court of Justice to rule that were the UK to repeal the European Union (Withdrawal) Act 2018 (c. 16) and associated and subsequent legislation, Article 50 could be revoked. This of course would come at a price. A heavy price: No more rebate! Labour, or more precisely comrades Corbyn and McDonnell, wish to see a general election in the hope that they could form a majority government. However, whilst Messrs Corbyn and McDonnell are Eurosceptic, the majority of the Blairite MPs are anything but! It may very well be the case that the Labour Party conference may decide to demand a second referendum on Brexit. That means that were a general election to be called Comrade Prime Minister Corbyn may find himself organising a second referendum! Now it MUST be noted that it is axiomatic that a second referendum has to take place before Friday 29th March 2019! It must also be noted that were a second referendum to take place the same tales that Shangri-La awaits on April Fool’s Day 2019 would be told to the voters. The other thing is that it is by no means certain that Comrade Prime Minister Corbyn would have a significant majority. He might be reliant of Liberal Democrat and SNP support. Comrade Corbyn’s sidekick, Comrade McDonnell does not wish to revisit the Brexit question but prefers to have the voters decide between types of Brexit. This is unlikely to carry the support of most Labour activists. Labour may however wish for more than one question on the ballot paper. Question #1 might be: “Should the UK request an extension of the Article 50 two year period to negotiate a withdrawal agreement and a Free Trade Deal? Question #2 might be: “Should the UK request an extension of the Article 50 two year period to negotiate a withdrawal agreement and continuing membership of the European Economic Area (Single Market) and membership of EFTA? If this is the case, then the Alternative Vote would be the method to use. It is however that NONE of these scenarios will come about! It may well be the case that there are many on the right of British politics who will be hoping for a hard/no deal Brexit. You see, should the People of United Kingdom of Great Britain and Northern Ireland wake up on the morning of Saturday 30th March 2019 to the chaos of a hard/no deal Brexit then they will find that they have collectively crossed a Rubicon for the UK will legally be no longer a member of the EU; NOR will it have any trading relationships established with many major economies! The result of this will be a rapid collapse of the government and a general election. The new government will inherit a parlous situation! Membership of the EEA and EFTA could NOT be accomplished quickly! Becoming the de-facto 51st State of the USA could not be accomplished quickly and would be politically suicidal as it would involve dismantling the NHS and replacing it with a privately run insurance based health care system with former NHS hospitals owned by US health care conglomerates and charging hefty fees! The one thing that COULD be done quickly - and speed would be of the essence - is emergency re-entry into the EU! This would involve membership of the ERM prior to joining the Euro. This would also probably involve membership of the Schengen Area. What it would also mean is that Comrade Corbyn could kiss goodbye to any hard left economic policies of renationalisation and large scale borrowing and spending as the EU would not allow them. As for Comrade McDonnell’s barmy plan to syphon off shares in companies such as Royal Dutch Shell to the government, does he not realise that such companies would avoid this eventuality by re-incorporating overseas and de-listing their stock from the London stock exchange? Many Kippers are looking forward to Saturday 30th March 2019 and hoping for a hard/no deal Brexit. This organ warns them: Be careful what you wish for. You might get it! IF a hard/no deal Brexit occurs at 11:01PM on Friday 29th March 2019, then do NOT expect to be celebrating the continuing independence of the UK on Sunday 29th March 2020 for it is far more likely that the UK will be back in the EU and in the Eurozone on that day!